To date, there are four known classes of lipid modifications to proteins: palmitoylation, myristoylation, the addition of a GPI anchor and isoprenylation. Of these modifications, it appears that only palmitoylation is readily reversible, perhaps providing an additional mechanism by which the activity of a protein can be modulated. Palmitate is usually found attached via a thioester bond to cysteine residues, which can reside at any point in the primary structure of the protein, but is usually found at positions that are close to the membrane. There are two classes of proteins that contain covalently bound palmitate. A relatively minor subset are transmembrane glycoproteins and these are usually acylated shortly after synthesis, in a compartment between the ER and the Golgi. 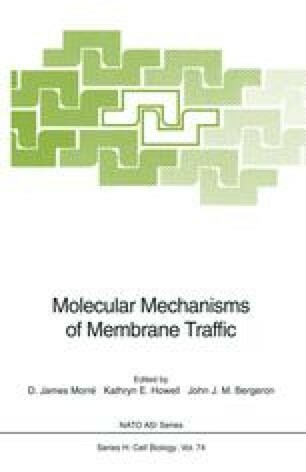 The majority of the palmitoylated proteins, appear to be otherwise hydrophilic proteins, that are tightly associated with the cytoplasmic face of cellular membranes. A number of palmitoylated proteins have been shown to undergo reversible fatty acylation, including several members of the ras super family, several erythrocyte cytoskeletal proteins, and in 1987 there was a report by Glick and Rothman (1987) that a cycle of reversible acylation might be involved in Golgi transport. At that time I was interested in how transport to the Golgi apparatus was inhibited during mitosis and thought it might be possible to identify possible target proteins for acylation, by comparing the acylation patterns in mitotic and interphase cells.